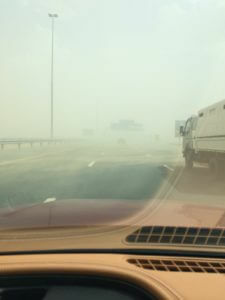 Recently we had some very unstable weather conditions in Dubai with sandstorms and some showers at the same time. As such we at Calder Car rentals have some tips for safety and precautions. 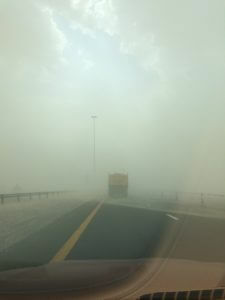 1/ Driving in a sandstorm can be very challenging and extreme care has to be taken to avoid any accidents . Safe distance should be kept at all times. 2/While approaching a heavy vehicle ,as shown in the picture to the right , be careful of the backwash of sand that the Heavy vehicle causes. This can easily reduce visibility to nothing. 3/Sand patches reduces wheel traction and can cause a vehicle to lose control. 4/Having your car lights on dim would increase your visibility to others. Full beam should be avoided since it will hit the sand particles and create an opaque blanket in front of the car and thus reducing visibility even more. 5/Should you experience a breakdown try an find an exit and park in a safe place.If thats not feasible and you have to park on the hard shoulder please do not stay in the vehicle. Its better to find a safe place outside for all the occupants to wait since the risk of accident on hard shoulders is much higher.